- Strength and beauty unite in this simple but striking Celtic band ring. Made of stainless steel, and polished to a high luster, this ring has an indefinable allure that is sure to catch the eye. Ring measures approx. 1/4" in diameter. Choose Size... Size 9 - Sorry, Sold Out! Size 10 - Sorry, Sold Out! Size 11 - Sorry, Sold Out! Size 12 - Sorry, Sold Out! Please choose the Size. As economical as it is beautiful, stainless steel also offers superior strength, and the opportunity for finer details in the designs. 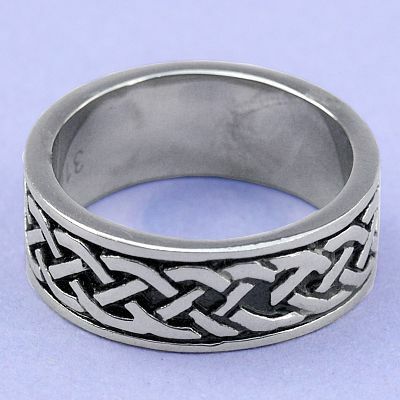 Do you have any other questions about our Celtic Braid Steel Ring?